We have pancakes on a pretty regular basis on our house. Normally a weekend lunch. They are an easy (and cheap) meal, our daughter inhales them, and pulled out of freezer they make the perfect weekday morning breakfast for my daughter. Sometimes it’s fun to change up the flavors. 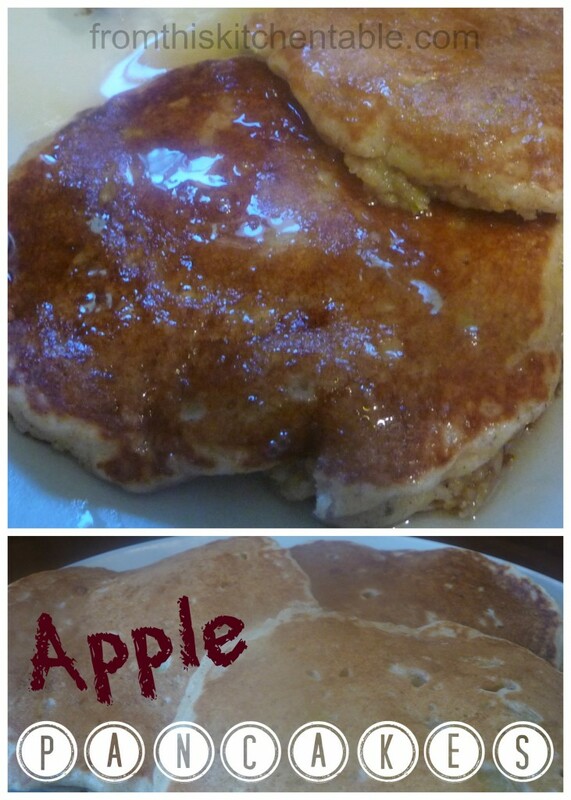 We’ve been having a lot of pumpkin lately but since I still have a drawer full of apples to use I decided to whip up some apple pancakes. They were a hit. My daughter ate four of them in no time at all and she can look forward to the leftovers all week for breakfast. In a large bowl mix the flour, baking powder, salt, sugar, and cinnamon. In a small bowl whisk eggs, milk, melted butter, and vanilla. Add wet ingredients to dry and stir gently. Cook pancakes over medium heat. This entry was posted in Uncategorized on November 22, 2013 by Deanna Michaels. Oh wow, these look sooo good. We are pancake eaters here too, my son loves them! This sounds yummy and easy enough to just add grated apple, good idea! Pancakes are easy and good! Ha ha, there must be something about almost 3 year olds and pancakes. The apple makes them extra tasty! They are yummy and easy! Maple syrup and butter put them over the top. Thank you so much for linking up to The Weekend re-Treat Link Party this week on The Best Blog Recipes! Wanted to stop by and “Pin” your post to our Link Party Boards (Recipes or Crafts) while I was here ! Thank you so much for hosting each week! I love you link party. Thanks also for pinning my apple pancake recipe – I really appreciate it! Great idea to add an apple twist! I’ll definitely give them a try! Thanks for sharing. A yummy and simple twist! Thanks for stopping by! How many pancakes does this make? Sorry it’s taken so long to respond. If you’ve already made them, I’m curious how many you got out of it. It honestly varies for me every time depending on the size I make them. Around 16 though.